Lose yourself in the history of your favourite soap with this fun and fascinating colouring book, which is sure to delight Corrie fans old and new. Not just a relaxing and creative activity book, this also serves as a potted history of the show with your favourite characters from over 55 years of storylines and drama. The book is made up of 45 scenes to colour in, from Elsie Tanner in the very first show, through classic scenes and iconic title shots, and ending up with the stars of the current episodes. 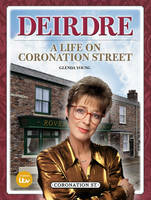 Coronation Street is Britain's longest-running and best-loved soap. Now you can pick up your colouring pencils and immerse yourself in the history of your favourite street.